THIS AR15 BULLET BUTTON CAN BE USED ON ALL AR15 TYPE RIFLES AND AR10 TYPE RIFLES USING A STOCK AR MAG RELEASE. A BULLET TIP CAN BE USED AS THE TOOL. IT IS MADE OF BILLET ALUMINUM AND IS ANODIZED. AR15 / AR10 PRINCE 50 MAG LOCK. 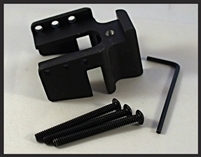 THE PRINCE 50 MAGLOCK CAN BE USED ON ALL AR15 TYPE RIFLES AND AR10 RIFLES USING A STOCK AR BUTTON. 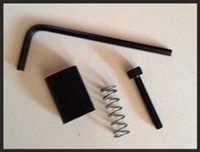 IT LOCKS THE MAGAZINE IN PLACE WITH THE USE OF A SET SCREW. LOADING IS ACCOMPLISHED BY OPENING THE ACTION AND FILLING THE MAGAZINE FROM ABOVE. IT IS MADE OF BILLET ALUMINUM AND IS ANODIZED. AR57 BULLET BUTTON. THE AR57 BULLET BUTTON ® ALLOWS FOR A CALIFORNIA COMPLIANT RIFLE CONFIGURATION. IT INSTALLS WITHIN MINUTES AND REQUIRES NO GUNSMITHING. 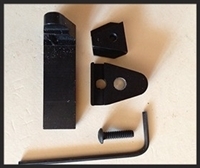 THE PRODUCT COMES COMPLETE WITH 2 SIDE PLATES, A NEW MAG LATCH, AND ALL SCREWS. BLACK ANODIZED ALUMINUM AND BLACK OXIDE STEEL. BERETTA ARX 100 BULLET BUTTON®. BERETTA STORM - 8800 MAGS (.45 ACP) MODEL BULLET BUTTON®. 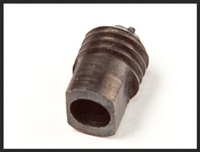 THIS BULLET BUTTON IS MADE OF CARBON STEEL AND HAS A BLACK OXIDE FINISH. 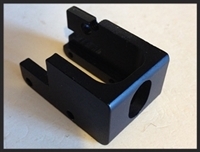 THE COVER TO THE BULLET BUTTON® IS MADE OF 6061 BILLET ALUMINUM AND IS ANODIZED BLACK. BERETTA STORM CX4 - 92F (92 FS) MAGS (9MM/.40 CAL) MODEL BULLET BUTTON®. THIS BULLET BUTTON IS MADE OF CARBON STEEL AND HAS A BLACK OXIDE FINISH. 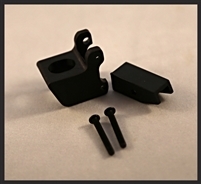 THE COVER TO THE BULLET BUTTON® IS MADE OF 6061 BILLET ALUMINUM AND IS ANODIZED BLACK. BERETTA STORM CX4 PX4 MAGS (9MM/.40 CAL) MODEL BULLET BUTTON®. THIS BULLET BUTTON IS MADE OF CARBON STEEL AND HAS A BLACK OXIDE FINISH. 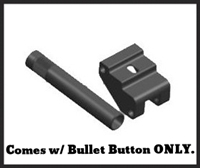 THE COVER TO THE BULLET BUTTON® IS MADE OF 6061 BILLET ALUMINUM AND IS ANODIZED BLACK. Bullet Button Convertible. For standard AR-15 model rifles. 2016 CA compliant (not 2018). CMMG MK47 (MK-47) MUTANT BULLET BUTTON®. CMMG MK47 MUTANT GEN 2/ VERSION 2 BULLET BUTTON®. THE FN FS2000 BULLET BUTTON ® IS DESIGNED TO FIT FN FS2000. 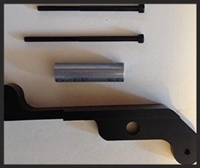 THIS FN FS2000 BULLET BUTTON ® IS MADE OF BILLET ALUMINUM AND IS ANODIZED. FN M249 SAW BULLET BUTTON®. FN PS90 BULLET BUTTON. THE BULLET BUTTON® RELEASE MECHANISM IS MADE OF 6061 BILLET ALUMINUM AND THE BULLET BUTTON COVER IS MADE OF CARBON STEEL. **STOCK STOPPER NOT INCLUDED** FN SCAR / FNAR / WINCHESTER SX-AR BULLET BUTTON®. THE FN SCAR BULLET BUTTON® IS MADE OF HIGH GRADE STEEL AND FINISHED WITH BLACK OXIDE. THIS HI POINT BULLET BUTTON® IS DESIGNED TO FIT HI POINT CARBINES. THIS HI POINT BULLET BUTTON® IS MADE OF BILLET ALUMINUM AND IS ANODIZED. HK 416 BULLET BUTTON®. A BULLET TIP CAN BE USED AS THE TOOL. IT IS MADE OF BILLET ALUMINUM AND IS ANODIZED. THIS BULLET BUTTON® ALLOWS YOU TO USE YOUR HK CLONE; FITS THE HK 91, MP5, AND PTR 91. HK MR 7.62 BULLET BUTTON ®. IT IS DESIGNED TO FIT THE HK 7.62. IT IS MADE OF BILLET ALUMINUM AND IS ANODIZED. 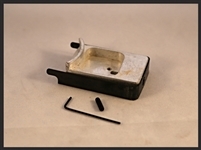 THE HK USC BULLET BUTTON® COVERS THE MAGAZINE RELEASE AND ATTACHES BY USING TWO SCREWS THROUGH PRE-EXISTING HOLES THAT ATTACH THE MAG RELEASE TO THE RECEIVER. 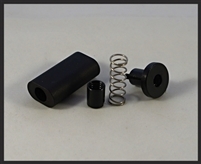 THE HK USC BULLET BUTTON® IS MADE OF BILLET ALUMINUM AND IS ANODIZED BLACK. **COMES W/ BULLET BUTTON ONLY** KEL TEC RFB BULLET BUTTON. 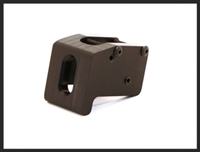 THE BULLET BUTTON® IS MACHINED OF 6061 BILLET ALUMINUM AND IS ANODIZED BLACK. KEL TEC SU 16 BULLET BUTTON®. 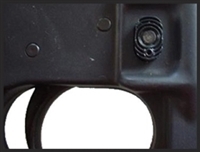 THE KEL TEC BULLET BUTTON® ATTACHES TO THE RECEIVER USING THE TWO EXISTING SCREWS NEAR THE MAGAZINE RELEASE OF THE RIFLE. 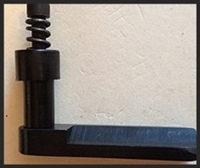 THE KEL TEC BULLET BUTTON® IS MADE FROM BLACK DELRIN. KEL TEC SUB 2000 (SUB2000) BULLET BUTTON®. 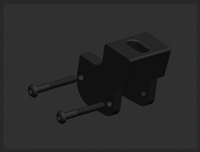 MACHINED OF 6061 BILLET ALUMINUM AND IS ANODIZED BLACK. THE BULLET BUTTON ® INSTALLS BY REMOVING THE SCREW DIRECTLY ABOVE THE MAG RELEASE AND PLACING THE BULLET BUTTON ® ON THE MAG RELEASE AND INSTALLING THE NEW SCREW INCLUDED IN THE PACKAGE. LIKE ALL BULLET BUTTONS IT IS COMPLETELY REVERSIBLE AND REQUIRES NO GUNSMITHING. ROCK RIVER ARMS (RRA) LAR 8 BULLET BUTTON®. THE LAR 8 BULLET BUTTON® ATTACHES TO THE RECEIVER USING AN EXISTING HOLE THAT ATTACHES THE MAG RELEASE TO THE RIFLE; AN ADDITIONAL SCREW IS USED TO ATTACH THE BULLET BUTTON. THE LAR-8 BULLET BUTTON® IS MADE FROM BILLET ALUMINUM AND IS ANODIZED. LONE WOLF G9 GEN 2 MODEL BULLET BUTTON®. LONE WOLF G9 GEN 2 / VERSION 2 BULLET BUTTON®.